Helen Houliston, left, 92, cheers after her ball knocks down several pins. It was the first time she bowled in as long as she can remember, she said. Jim Mullaney, 92, releases the ball as his teammates from The Strikers watch. June Keller remembers her highest score in bowling – a 285 rolled during a state bowling competition in Pittsburgh long, long ago. 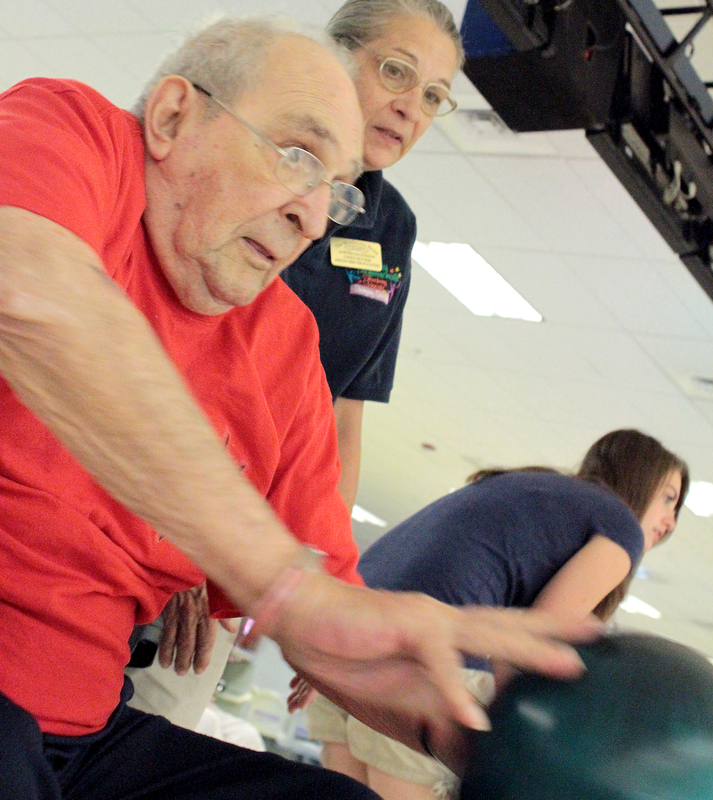 Keller, 89, had to give up bowling long ago, but now she has a chance to start the ball rolling again thanks to a new bowling club at the Middletown Home where she lives. The bowling club members call themselves The Strikers, and they held their first match on Tuesday, Aug. 9. Having bowled in leagues in the 1950s, Keller was up for taking a trip out to ABC East lanes on Eisenhower Boulevard. “I remember when it only cost 75 cents to bowl a game,” said Keller, who spoke of her memories of the game. Jim Mullaney, 92, use to hangout at a bowling alley on Cameron Street in Harrisburg where he played with friends and coworkers. All members of the team are in wheelchairs. So how do they play? 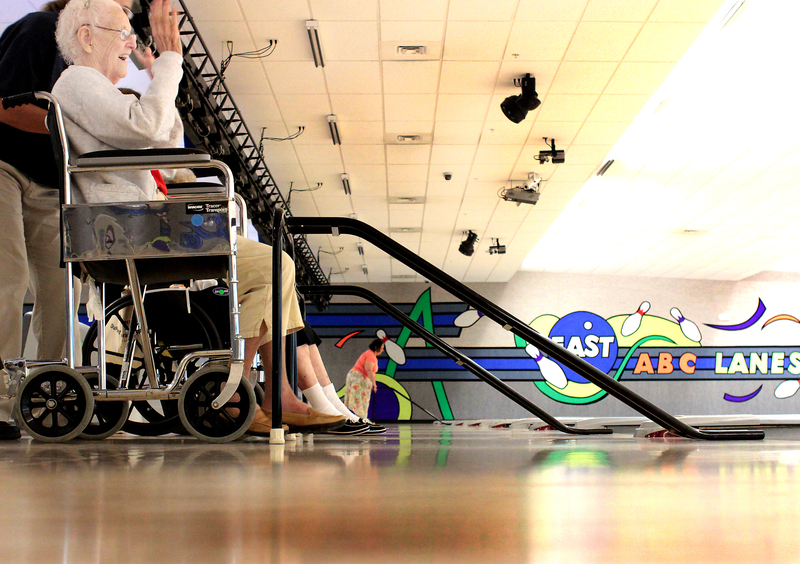 Two metal shutes were provided by the bowling alley, that allowed the players to set the ball and aim it from their wheelchairs. “It’s great for our residents to get out of the home, and easy, because we just wheel them in, there is easy access,” said Mary Van Buren, activities organizer for the home. The group plans to bowl once a month at ABC lanes, she said. Helen Holiston, 92, who is particular about lining up her shot, said she enjoys the activity. “It’s good to get out [of the home] for a bit,” she said. Pat Gutshall, who will be 78 in November, smiles and laughs as her ball strikes all but two pins during the second game on Aug. 9. Gutshall said this is the first time she has played in years. “I am looking forward to playing again,” she said. The group of six players hope to find others from similar facilities to create a league, said Van Buren.